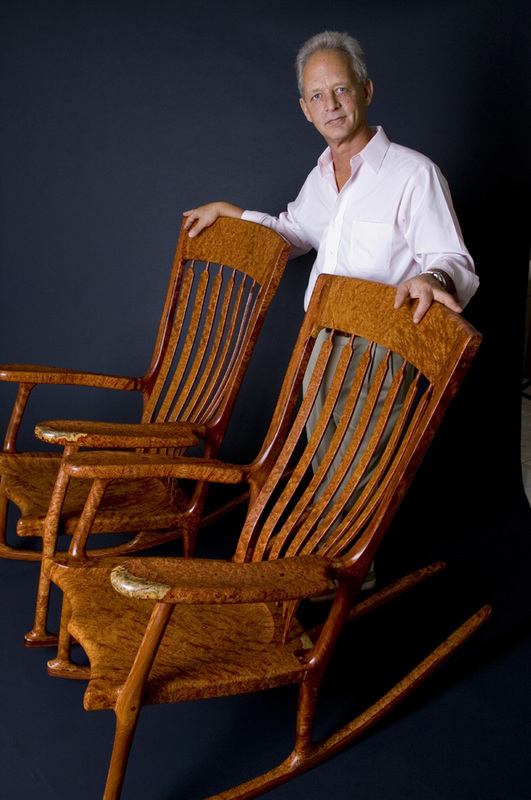 Prices: I can make your rocking chair in any number of different woods with prices starting at: $5,500 - American hardwoods like Plain Maple, Curly Maple, Ambrosia Maple, Sycamore, Cherry, and Eastern Black Walnut. Accent woods are $300 extra. If you would like your chair made from other more exotic woods like English walnut, Claro Walnut, Birds Eye Maple, Rosewood or Flame Cherry the price varies from $6,500 - $8,000 depending on availability and wood cost. Amboyna Burl, old growth Curly French Bastogne Walnut, Curly Redwood, 50,000 year old Kauri and other very rare woods are more expensive and can take up to three months to create. Terms: 50% on order, the balance prior to shipment (I will email you digital photos of your chair prior to shipment). Deposits are non-refundable. Shipping and insurance are added to the final amount and within the continental U.S. range from $450 - $750 depending on how far you live from me. I ship in very sturdy wooden crates.If you live within a few hours of Sarasota, FL I would be pleased to deliver it myself at no charge. If you are not within the continental U.S. I will get you a firm quote on shipping prior to taking your deposit. Shipping is at customer's expense. Important: If you order a chair from me and there is any visible damage to the crate please make a notation on the delivery receipt, take good photos of the crate before opening and then good photos of the chair if there is any damage. It is also essential to preserve all packaging materials for me to make a successful insurance claim. Matching pair of his and hers amboyna burl rocking chairs. My old shop during a busy period.